The Rio Olympic Champions In Numbers ~ Feel For The Water! Advice & Tips to Improve Your Swimming. If you've been following Paul Newsome's twitter feed this week you'll have seen that he's been digging into some of the data from the pool at the Rio Olympics. A big shout-out to Triton Wear for making this data available to everyone on their website. If you like your numbers, hold onto your hats! The results firmly dispel some of the age-old myths about swimming, such as the idea that the difference between mere mortals and great swimmers is that Olympic champions take fewer strokes than anyone else. Notice also how silver medallist Connor Jaeger starts with a super-long stroke (28 strokes per 50m) but simply cannot sustain it, with his stroke continually shortening out to 39 strokes per length (the same as Paltrinieri). - If your natural style is to swim with a shorter stroke at a higher stroke rate, stick with it. Of course you should always look to fine tune your technique within that style but there's nothing fundamentally wrong with this way of swimming - just look at Paltrinieri's amazing 14:34 for 1500m. - An overly long stroke simply isn't sustainable. 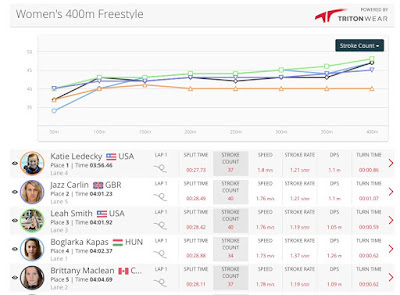 Try and find the right balance between the length of your stroke and the rate of your stroke for you (see Ledecky's data below). 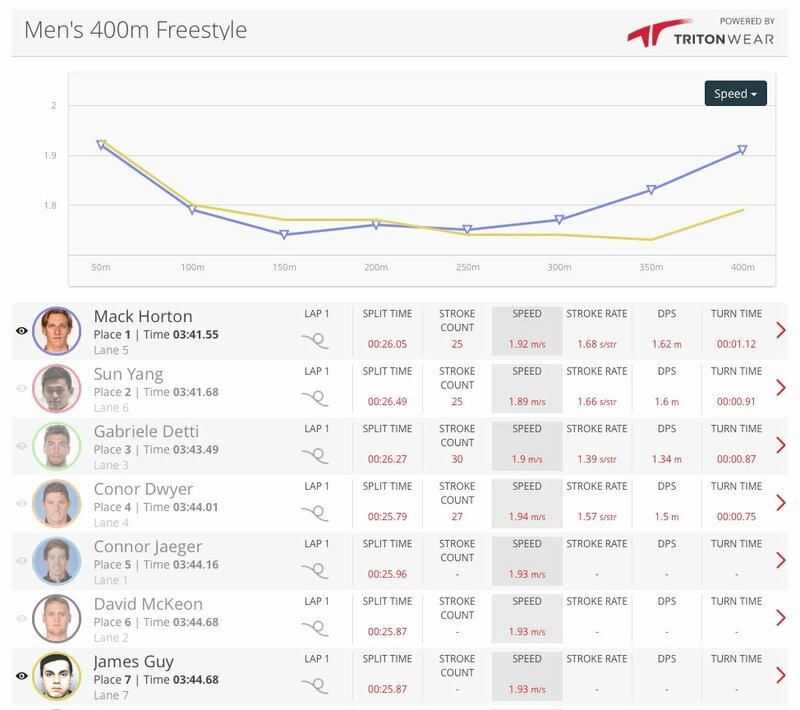 After the first length (from a dive of course) the top 5 are taking between 40 and 48 strokes per 50m, which aren't particularly long strokes for Olympic swimmers. However it's Katie who's stroke is so incredibly consistent - not too long, not too short, perfectly judged and sustainable at 40 strokes per length. What's actually happening is that she's uses a stronger kick pattern in the second half which lengthens her stroke from the additional push it provides. Katie's got a great ability to switch between a 2 beat kick and a 6 beat flutter kick and over the first half of the race uses the 2 beat for 60-70% of each length before finishing with the more powerful 6 beat kick. However in the second 400m, she employs the drive from the 6 beat kick much earlier, lengthening out her stroke. 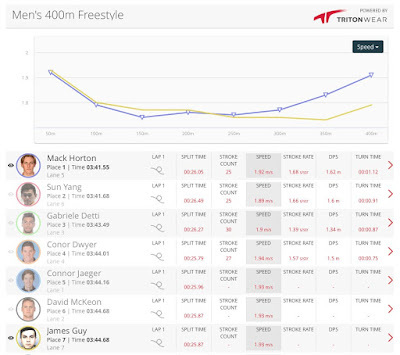 The data suggests that she's totally under control aerobically at the 400m mark with the majority using a 2 beat kick. At this point, rather than slowing she adds in additional drive from the legs to bring her home in a new world record (which she was chasing of course!). Whilst it wasn’t a negative split, she swam the first half in 4:01 and the second in 4:03 (the dive start being worth ~2 seconds). If you watch the race it looks like Kyle negative splits but of course the dive start always means a faster first 50 but only slightly in his case - perfectly judged pacing under extreme pressure! Well, i disagree with Swim Smooth here. In my view 40 stroke count for Ledecky does mean a long stroke. And for the men 30, 32 or even 39 for Paltrinieri mean a long stroke too. I agree it is important to have a continuous stroke but it is also important to use the non-pulling arm as support in the water. Thanks for the observations and insights. Just want to point out that Efficiency is very different from Speed. In races, you would sacrifice efficiency for speed. For example, the more powerful 6-beat kick is less efficient because it burns more energy but gives disproportionately little extra propulsion. However, in a race, you wouldn't mind expending some energy in a less efficient way to get that extra speed. The same applies to shortening your stroke. By cutting out the less powerful phases (beginning and end), you have a shorter, more rapid and more powerful stroke. You travel faster but have a shorter distance per stroke. You expend more energy over the same distance compared to a longer stroke. That is, the faster swimmers in a race are likely to be less efficient for a good reason. You want to optimize the relationship between stroke length and stroke rate. At any given tempo you'd like to have the lowest stroke count 'match' that is sustainable. Pursuing more of one usually means getting less of the other, so it's about optimizing the combination rather than favoring one tactic over the other. In Connor Jaeger's case, his switching up this relationship during his 1500 meter final did not alter his speed. From his 2nd 50 up through 1400 meters his 50 meter splits are within 0.4 seconds (and usually less than that.) So whether he selected longer strokes at a slower rate or shorter strokes at a faster rate, it didn't appreciably change his swimming speed. At the elite level we could make a case that a few tenths of a second are 'appreciable.' For the rest of us, given that the speed difference is negligible, we would want to ask "which strategy was most sustainable/was executed at a lower heart rate?" I can't speak for Connor as to which choice was more sustainable for him. It would be interesting to get his perspective. But it often turns into a "rob Peter to pay Paul" situation. Our human instincts tell us that 'moving our arms faster' makes us swim faster. In Connor's case, moving his arms faster meant swimming the same speed. Sun Yang's final 100 meter splits show that he gets a huge jolt when he switches into high cadence mode. It's not something he can sustain, but for these short bursts he is a master at increasing tempo while holding onto stroke length. Such is the aggravation built into the stroke rate/stroke length dynamic. Sometimes the pursuit of greater tempo compromises stroke length (and mechanics) so much that swimming speed slows. The same is true in pursuit of too much stroke length: tempo often slows to the point of negative returns. In Jaeger's case, it seems that whatever gains he expected for increasing tempo were canceled out by the decrease in stroke length. So it's a wash. My question for him would be, "since your speeds were the same at each strategy, which felt more sustainable?" Swimmers should look at their current stroke rates and stroke counts to see where the opportunity for gains lie. Someone taking 90 strokes per minute has essentially maxed out in the tempo department. Moving his arms faster isn't a viable option. Hitching a little better distance per stroke to that tempo (or to a slightly slower tempo) is probably the best strategy to increase velocity. Or take the converse, a low tempo/long stroke swimmer like Mack Horton. He's maxed out in the stroke length department, a cyclist riding in the biggest gear he can handle. To swim faster he likely needs to fold in more tempo without sacrificing much by way of distance per stroke. In cycling that would mean drop down a gear to increase cadence. Just don't drop the gear so much that it cancels out the benefits of the higher cadence. Otherwise he's pulling a Connor Jaeger. When comparing several swimmers who are all holding the same tempo, the guy who travels the farthest per stroke will swim the fastest. That's the irrefutable math of velocity: Velocity=Distance x Rate. Let's assume a rate of 90 strokes per minute. If 10 swimmers are all stroking at that frequency, which one is going to win? The one with the best distance per stroke at that tempo. I think this is what many swim coaches mean (at least, it's what I mean) when I say "the swimmer who takes the fewest strokes across the pool generally wins." 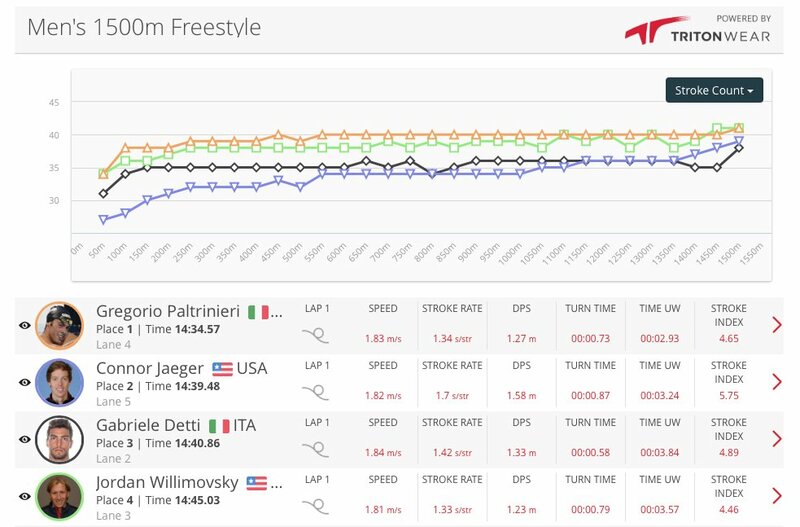 If we were to look at the earlier heats of the men's Olympic 1500 meters, or the Florida 13-14 boys division 1500 meter finals, we'd probably find several swimmers who stroke just as fast as Gregorio Paltrinieri. What we won't find is a single one of them who can do that at 39 strokes per 50 meters. 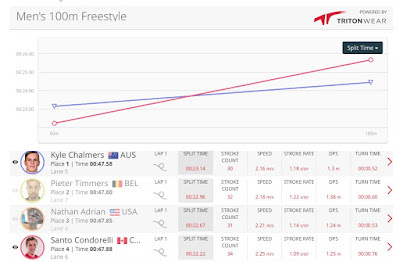 Paltrinieri's superior distance per stroke at that tempo is the DISTINCTIVE performance indicator, the thing he does different and better than the other swimmers. It's what allows his 90 strokes per minute to translate into sub-:30 splits. If these other guys want to catch him they have two choices: spin those arms faster, or cultivate better distance per stroke. "Twenty strokes per 25-yard length is a meaningful benchmark for where the swimming wheat and chaff are separated." 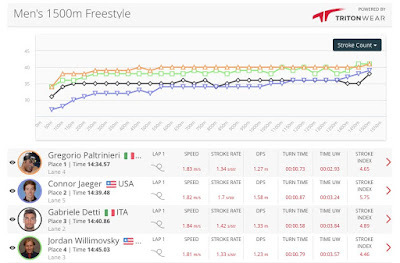 Jaeger's stroke is almost 50% longer than Paltrinieri at the start of the 1500, but the same by the end. "I've got it (my stroke count) down to 24 per lap, which is about as low as I want it to get. I could reduce it by another four strokes but the danger is that I'd get to the point where I'm gliding RATHER than swimming efficiently." Interesting how Thorpe separates the word GLIDE from EFFICIENCY here? The reality is even more stark. He is CAPABLE of a stroke count of 20-24, but used 30-32 when racing, so by his own measure, even Ian Thorpe wasn't that "LONG". So yes, we may view 40 strokes as "long" but it's far from being as "long as possible" which is historically what is taught and why so many people have gone down this pursuit path to detrimental effect. "If you like your numbers, hold onto your hats! The results firmly dispel some of the age-old myths about swimming, such as the idea that the difference between mere mortals and great swimmers is that Olympic champions take fewer strokes than anyone else." It's these age old myths (detailed below verbatim from as recently as 2004) which have caused people to over exaggerate the notion that the length of stroke is the most important factor in freestyle swimming and that stroke rate is something that should be either an after-thought or disregarded entirely. "Learning to glide as far as possible after each stroke is the single most powerful skill they (great swimmers) know"
"Keep your stroke as long as possible and your stroke rate as low as possible"
"Faster turn-over (i.e. higher SR) is precisely what we're trying to avoid"
"The same is true in pursuit of too much stroke length: tempo often slows to the point of negative returns." ...is all we are saying and - to give us our due -is all we've ever said. Our entire Swim Types model discusses in LENGTH about which type of swimmer is likely to have a stroke which is too long and too slow (the Overglider) and equally which is too short and too fast (the Arnie and some less advanced Swingers). So I'm glad we agree on these points Gary. Your insights here are useful but only further exemplify WHY this is an issue that must be discussed and - as per the point of the article - dispelled. "...the guy who travels the farthest per stroke will swim the fastest. That's the irrefutable math of velocity: Velocity=Distance x Rate"
...yup, and I'm not refuting this at all, never have. However, I would say that 90spm is nowhere near "maxing out" the stroke rate department, especially for shorter swimmers with smaller hands, narrower shoulders etc and of very aerobic physiology. Janet Evans - who everyone loved to criticise as being a "freak" or "not something that should be copied" had strokes rates well in excess of 100, as did Laure Manadou, both of whom were Olympic Champions. Janet took 45 strokes per 50m length. So I'm not refuting mathematics - they are correct - but I am refuting what we believe to be the limit of human endeavour, and NO ONE knows what or where that is Gary. ...my belief (as per my original article which brought you to pen your own), is that Horton had a mismatch between his kicking style and his stroke length in the 1500 (i.e. 2BK and long, "slow" strokes), compared with Paltrinieri who was perfectly matched (the same 2BK with a much faster, shorter stroke - in fact, 13 strokes per length shorter!!!). In my video review you'll see at 4:38 elapsed in the 1500 footage that Horton is doing this exact same kick start that my original article points to. Could this be the difference between Gold and 5th? Or was it that Horton was under the weather (as reported) on the day? 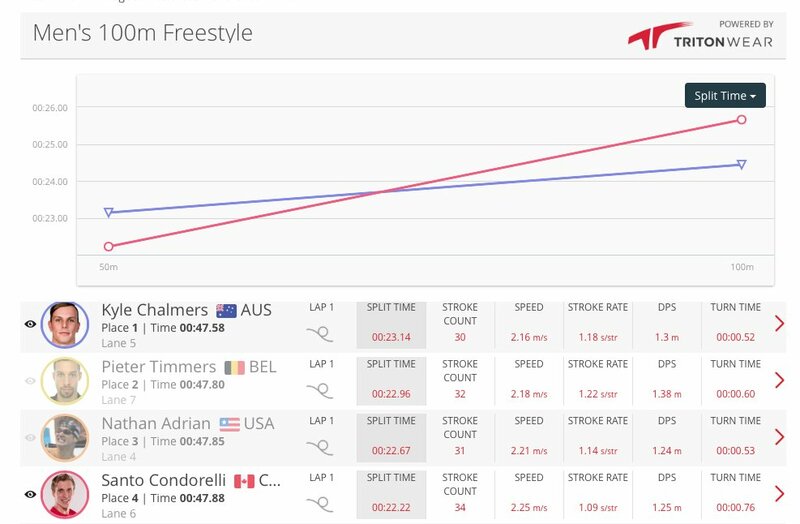 Could his 4/6BK applied in the 400 freestyle to take Gold be a much better match for his style of stroke (longer and slower)? Should the Overgliders of the world pay heed to this and either shorten up and speed up to match their 2BK style or should they match the length of their stroke to a continually propelling 6BK as per my original article, the one you had an issue with? I don't know all the answers, but I do know that I had this exact same discussion with Shinji following his failed attempt to swim the 20km Rottnest Channel swim in 2015 (which I also did). You'll know better than anyone that since that time Shinji has modified his stroke notably, even giving it a new acronym, his CROS (Cold Rough Openwater Swim), see: https://www.youtube.com/watch?v=TEKBSn5BXzY - seems someone was listening? His swim in a relay at the Clean Half in Hong Kong (viewable only via his FB page) was clear testament to this better matching of kicking type to stroking style being a success. I dare say he's going to smash the Rottnest Channel Swim when next we see him on our shores! I think there are probably two different 2 beat kicks, what I think you call a 'kick start,' where the downbeat of the kick leads to driving the arm forward and helps initiate rotation in the body. That's what we typically see in taller, (subjectively) lower stroke rate swimmers, and it's often a default pattern when swimmers shut the legs down. I would describe Sun Yang's dominant kicks as matching that rhythm (he does a few extra little flutters which are stabilizing movements more than propulsive ones.) Horton, too. I would be interested in asking them if their 2 beat kicks are intentional or simply "absence of trying to kick." Ledecky has really streamlined her 2 beat kick. Would also be interesting to see if this is an explicit choice she and her coach made. Maybe Horton could learn from her. Then there is the high stroke rate 2 beat kick, like I've seen Brooke Bennett do, where the downbeat of the kick connects to the catch of the stroke. I personally find the Bennett style really difficult to piece together effectively (I think Manaudou's is the same...sort of classic high stroke rate female swimmer.) I feel like I'm stirring the water up and going nowhere when I try it. I don't keep up with many coaches, TI or otherwise. Haven't seen Shinji in about 5 years, although Dave Cameron (TI coach who has done a couple of Channel crossings) said Shinji was playing around with some sort of hybrid stroke. I don't think we as humans have figured out the best way to swim yet, so I'm all for experimenting. 90 strokes per minute is a pretty brisk stroke rate, and those who swim consistently above that are outliers. I would look at other opportunities to improve velocity--drag reduction, improved leveraging, whole body synchronization, etc--before advocating ever-more tempo for the 90 and up crowd. I like to think of every stroke as having a propulsive potential but also a drag penalty (kicks, too, for that matter.) This could explain why Jaeger's swimming speed was pretty constant while alternating longer stroke and shorter stroke strategies: the additional drag of 7 or 8 stroking actions may counter the expected gain from higher cadence. But it is hard to know these things for certain so I try not to leap to conclusions. i don't know how we'd devise experiments to gather conclusive evidence on most things swimming. Until then, interpretations will vary (yours, mine, countless others who believe they are on to something), and that's just fine. When we met up I had the exact same conversation with him about his mismatched long, slow stroke with a 2BK whip kick, primarily from the knee and ankle down. My belief that this incorrect style of 2BK was what was bringing on the cramps he experienced in the calfs (due to the rapid, explosive "wind-up" movement). Over 1500m a swimmer could plausibly get away with it (though I still feel Horton experienced significantly more drag from this than Paltrinieri who maintained a much longer, straighter leg kick actually, seemingly only 1BK! ), but not over 20km into a very strong sou'wester! This issue made for a very broken swim which (I believe) combined with the low stroke saw Shinji developing a close to hypothermic state. It was certainly enough of an upset for him to question the style he was using and hence the "hybrid" stroke he subsequently went onto develop, so-called "CROS". I didn't rename this for him, but I was instrumental in getting Shinji to consider how he's best optimise his stroke for those conditions. Like you say Gary, this is all important and Shinji (knowing I'd finished top-10 in that particular race and having won the world's longest marathon swim, the Manhattan Island Swim with that exact same proposal of a well executed 2BK from the hip, not the knee and at an average SR of 81spm for 7+ hours) has opted to take that advice on board - all kudos to him. In essence, Shinji's improvement in performance was born from exactly what I had written in my original article to which you had more than a few objections about the legitimacy and validity of my statements. "This could explain why Jaeger's swimming speed was pretty constant while alternating longer stroke and shorter stroke strategies"
...this is my point EXACTLY: Jaegar's stroke didn't ALTERNATE between longer and shorter, it STARTED longer and finished (much) shorter, bringing into question the sustainability of such a stroke over that distance, again, the point of today's article for people to consider. OK. I've been following you guys for a couple of years now and have improved my stroke and efficiency and times significantly. I come from a college basketball background and only took up triathlon about 10 years ago. At this point, I largely focus on 140.6 and 70.3, and I've dropped my 2.4 mile swim from 1'20" to 1'07" just by following your tips on your blog. I'm not a big online comment type, but in reading about your assessment of Ladecky I am compelled to ask a question that came to mind. Your description of her stroke length and then kick pattern during the first 400m and how it changes in the second 400m is very interesting. Then you say this: "The data suggests that she's totally under control aerobically at the 400m mark with the majority using a 2 beat kick. At this point, rather than slowing she adds in additional drive from the legs to bring her home in a new world record (which she was chasing of course!). Whilst it wasn’t a negative split, she swam the first half in 4:01 and the second in 4:03 (the dive start being worth ~2 seconds)." So, if her 6 beat kick with the same stroke rate adds so much additional drive, why didn't she negative split? It she didn't negative split, she didn't add any additional drive. It seems like all she did was go to a more inefficient stroke and use a bunch more energy to swim the same speed. Wouldn't it make more sense to keep the same kick during the second half but instead increase her stroke rate? If you re-watch the footage it's really interesting to see how much her kicking rhythm changes throughout. She's so, so versatile in her stroke, unlike anyone else I've ever seen. Amazing stuff. Anyway this stroke length vs stroke rate debate seems to be never-ending. I'm a great fan of Gregorio Paltrinieri and I like swingers very much. However Ferry Weertman showed the most catchup stroke I'd ever seen in the 10k, often sub 60SPM and he cut through the swells no problem. Hi Salvo, you're quite right - Weertman had a very long stroke...the critical difference between him and the Overgliders of the world though? 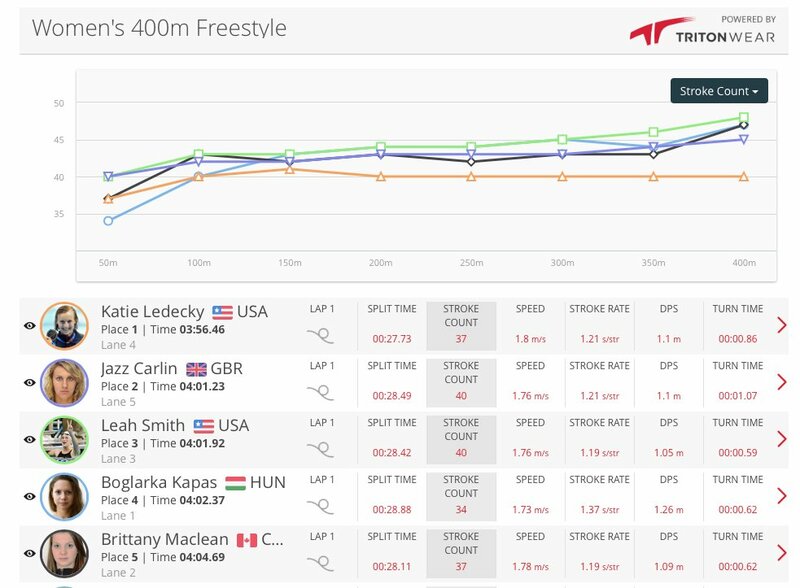 A massively PROPULSIVE freestyle leg kick, exactly my point with Mack Horton in the 400m (strong kick) versus the 1500m (steady 2BK) - the steady 2BK is a mismatch for the ultra-long stroke when trying to maintain momentum (as is required in the ocean of course). In this case then Weertman was totally right in what he was doing. Remaining in the pack for the first 85% of the race (compared to Poort off the front) helped conserve enough energy to make this type of kick viable. Furthermore, a swelly course with the swell coming directly from BEHIND tends to suit a longer stroke IF combined with the stronger kick of Weertman in order to literally ride the swell like a body-boarder might do. Brilliant. We saw this at the 2014 Rottnest Channel Swim (typically a SW cross/head wind which suits higher tempo strokes), but in 2014 we had a strong easterly which literally PUSHED the swimmers across. Who benefitted the most? That's right, the Smooths and the Kicktastics in my squad, the Swingers hated this year. Horses for courses as they say. Versatility = Performance. Mismatching never works.